The Beth E. Childs/Genna Hurst Renewable Scholarship administered by the Calaveras Community Foundation was presented during awards night at Calaveras High School in late May. The 2018 Scholarship Committee selected Corina Mata as the recipient. The Childs/Hurst scholarship is a 4-year $4,000 renewable scholarship awarded annually to a graduating student residing in the West Point/Wilseyville area. 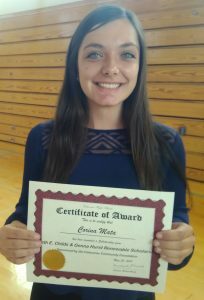 Corina, who resides in West Point, has maintained a consistent 3.6 GPA at CHS. Her determination shows through in her scholarship application as teachers and school administrators attest to her ability to set goals and achieve them. Her ultimate career passion is to achieve a degree in Communication Sciences & Disorders. At an early age, she got the motivation she needed to become the hard-working, goal-driven young woman she is today. She will be attending American River Community College for her prerequisites and then transfer to an undetermined university. Dedicated to volunteering, Corina excels when she is helping others. Her passion at CHS has been to be involved with Circle of Friends and Peer Mentoring. This allowed Corina to offer support to other students who were struggling academically or emotionally. Volleyball was her sport of choice. Coaching sixth grade volleyball at Mokelumne Hill Elementary School was a natural for her. She became a positive influence for students both through her words and her actions. Corina truly reflects the organizational skills and dedication to succeed in any endeavor she attempts. Being passionate about “giving back” and helping others will take her far towards her career goals.